Seve Ballesteros, one of golf's most gifted and charismatic players, has died after a long battle with cancer. The 54-year-old passed away surrounded by his family at his home in Pedrena, northern Spain, in the early hours of Saturday morning. Ballesteros was diagnosed with a brain tumour in 2008 after losing consciousness at Madrid Airport. The five-time major winner had four operations to remove the tumour as well as undergoing chemotherapy. The funeral will take place on Wednesday at the San Pedro parish church in his home village of Pedrena, near Santander. In a statement, the Ballesteros family expressed gratitude for the "support and gestures of love" they had received and asked for "respect and privacy at such a painful time". Ballesteros, who claimed 87 titles over his career, won the Open in 1979, 1984 and 1988 and became the first European to win the Augusta Masters in 1980, repeating the feat in 1983. He also enjoyed a successful Ryder Cup career as both player and captain - playing in eight Ryder Cups and winning 22½ points from 37 matches before guiding Europe to victory over the United States at Valderrama in 1997. But it was his daring and flamboyant style that made Ballesteros special, transforming the image of golf and bringing a whole new audience to the sport. BBC golf correspondent Iain Carter said: "No golfer did more to popularise the game in Europe than Seve Ballesteros. "He played a fearless, exciting and charismatic brand of the game. It thrilled sport fans all over the world." "It's a sad day," world number one Lee Westwood said on Twitter. "Lost an inspiration, genius, role-model, hero and friend. Seve made European golf what it is today. RIP Seve." Ballesteros' fellow Spaniard Sergio Garcia added: "He was a game-changer. To come from where he did and do what he did was amazing." 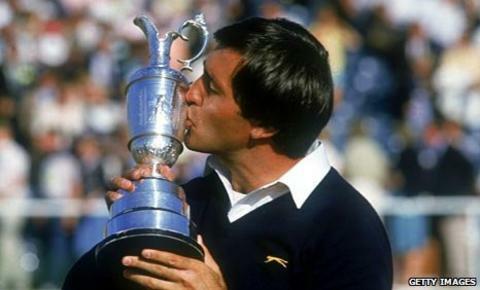 Colin Montgomerie, the winner of eight European Tour Order of Merit titles, said: "Very few people are called legends in this world and Seve was one of them. "We've lost one of the great icons of the sport, but may we also celebrate Seve's life. I think it's only right at this time - what a character and what a passionate man he was. "It was an honour to play under him as our captain in the Ryder Cup and an honour to play with him." Former world number one Tiger Woods, a winner of 14 major championships, said on Twitter: "Seve was one of the most talented and exciting golfers to ever play the game. "His creativity and inventiveness on the golf course may never be surpassed. His death came much too soon." The European Tour will mark the loss of one of its most iconic talents with a minute's silence during Saturday's third round of the Spanish Open. The flags at Real Club de Golf El Prat will be flown at half-mast, while the players will wear black ribbons. Tennis star Rafael Nadal described Ballesteros as a "reference point" for Spanish athletes. "He's one of the greats of this country without a doubt," he said. BBC golf commentator Peter Alliss added: "He was a fighter - feisty, skilful, cheeky and loveable. "He had hair as black as raven's wing, a wonderful set of teeth and a lovely smile. When Seve was in a good mood the world was happy. I will always remember that smile. "He had a very sad end but I will remember all the good things." Ballesteros sprang to prominence as a 19-year-old, finishing second to Johnny Miller at the 1976 Open and becoming the youngest winner of the Claret Jug three years later. His final round of 70 featured an astonishing recovery shot from a car park to set up a birdie at the 16th hole. He became the youngest winner of the Masters at the age of 23 in 1980 and made his Ryder Cup debut later that year. Ballesteros topped golf's world rankings for 61 weeks between 1986 and 1989 and won the World Match Play Championship five times, equalling Gary Player's record. With his game starting to decline because of back problems, Ballesteros won the last of his record 50 European Tour titles in 1995. And although he continued playing intermittently until 2007, he was generally a pale imitation of his former self and rarely featured on leaderboards. Ballesteros appeared in public for the first time following the surgery in May 2009 when he went to watch his local football team Racing Santander and was given a standing ovation. In December 2009 he appeared on television to receive the BBC's Lifetime Achievement Award at the Sports Personality of the Year event from his former Ryder Cup partner - and now captain - Jose Maria Olazabal. He had called his battle against the tumour the "hardest challenge of my life."